In 1988 the international diplomatic community requested that the United Nations establish an international school in Hanoi to support the development of Viet Nam. A Memorandum of Understanding was signed between the United Nations Resident Coordinator and the Ministry of Education and a start up loan of 75,000 USD was made available by UNDP and UNICEF with UN HQ approval. The Head of School at UNIS NY, Joe Blaney, was instrumental in establishing the Hanoi school premises and furnishing resources, including the secondment of a UNIS NY teacher to become the first Head of School, Dr Alice Ann Winter. The Vietnamese government granted tax exemption and the right to charge fees and to fundraise for the School, and the first teachers, hired through the UNDP were afforded comparable status to UN Agency workers. A governance structure for the new school was established, which has been amended over the decades, but has always included Board members appointed and/or approved by the UN Resident Coordinator for Vietnam as an important part of the structure. Today the UN Resident Coordinator in Viet Nam remains the highest authority for the School, appoints the three UN Board members, ratifies all Board appointments and reserves the right of school dissolution and the right of veto for constitutional amendments which might affect the UN nature of the School. Since its pioneering early days, UNIS Hanoi has repaid its start up loan and become a financially independent non-profit institution. 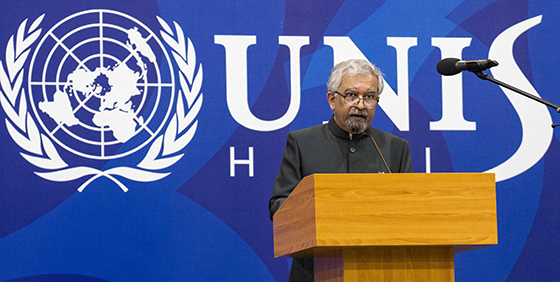 It has become a school at the forefront of international education and as such plays a significant role in the UN’s ability to attract the highest quality talent for its programmes in Viet Nam. As one of only two UN International schools, UNIS Hanoi can also be considered a point of pride for the UN in Viet Nam. A success story in its mission to ensure the relevance of the United Nations with young people and to provide an outstanding legacy of the UN’s investment in Viet Nam. And the School retains operational benefits afforded to it by the Vietnamese Government due to its status under the auspices of the United Nations including; tax, visa and work permit benefits; not-for-profit legal framework and the right to fundraise; use of the UN logo and the support of the UN Resident Coordinator for Viet Nam.